Why Are Gas Pack Repair or Replaced More Often than Split Systems? A very common question that’s often heard from Charlotte area homeowners, many folks simply want to know why Gas Packs or Gas Packaged Units, seem to have more problems, require more repairs, and need replacement so much sooner than split systems in the same type of home? The short and easy answer is also the most obvious… constant exposure to the extremes of weather. In this Charlotte HVAC Guide article, we’ll help you understand more about the lifespan of gas packs and packaged hvac systems, and why they seem to require more repairs than other types of home hvac systems. With proper air conditioner maintenance and annual furnace service, you should expect your gas pack unit to last between 8-12 years on average. Some gas pack units will fail earlier than eight years and others, with less than harsh conditions, can last longer than 12 years. In most cases however, you should plan on your gas pack lasting for 8-12 years. If yours is more than 8 years old and in need of repair or replacement, click here for free quotes. 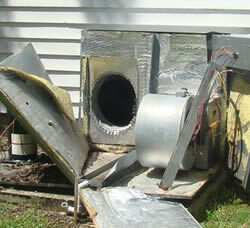 Since packaged units have the furnace, air conditioner, and all other components like fan blowers and evaporator coils packaged into one compact outdoor unit, they are highly susceptible to corrosion and the harsh realities of being outside. If you’ve ever seen an old muffler system come off a used car, you know exactly what the inside of a gas pack looks like after 10 years. Gas pack repairs are no different from those on split systems, they each contain almost all the same parts and the cost of HVAC repair is very similar. The main difference is that when your split central ac is blowing warm air, the technician needs to come inside and inspect both units. With a packaged unit, they can do everything from replacing a fan motor to recharging the central ac unit all from the outdoor unit. If your gas pack is more than 8 years old, you truly need to consider getting a replacement quote at the same time, versus paying for yet another repair. If the gas pack repair cost is more than $350-$400, and 8 years old, you might be better off installing a new higher efficiency gas pack unit than sinking more money into an old system that’s going to continue breaking down more often. How long did your gas pack last in the Charlotte area? How much was the replacement unit, and who was the Charlotte contractor who replaced it?